If you are in Tampa for business, leisure or both, discover the stunning new transition that’s both Wonderfully Wyndham and Quintessentially Quorom . 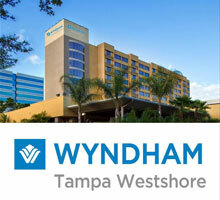 What was formerly known as the Quorum Hotel is now the Wyndham Tampa Westshore! This premiere hotel offers 12,000 square feet of meeting and event space, 272 spacious guest rooms, four junior suites and two executive suites and an executive club level, is just two miles from Tampa International Airport and Raymond James Stadium and positioned directly between two of Tampa’s largest shopping malls, many fabulous restaurants & entertainment venues all within walking distance. For your added convenience, the Wyndham provides complimentary shuttle service to the airport and to all Tampa attractions within a three-mile radius of the hotel and is easily accessible to other major venues such as the Tampa Convention Center, Old Hyde Park, Busch Gardens, Ybor City via Interstate 275.